When selecting an option symbol, the price history for the option itself is now automatically plotted beneath the underlying symbol. 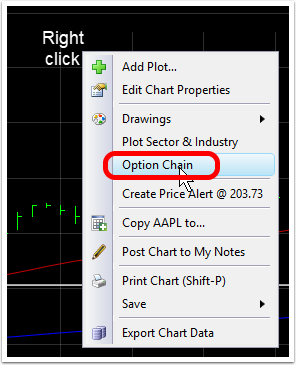 Here is how to view the option and underlying together. When you choose the symbol, the price history plot for that particular option will appear just below the price history for the underlying stock. Use the spacebar on your keyboard to move symbol by symbol through the Option Chain. As the symbol changes, price history for that option will be displayed below the underlying stock symbol. To learn more about the different ways to view the option price chart, click here.